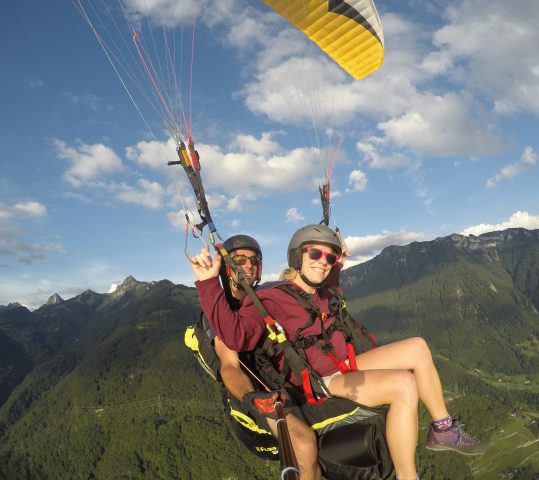 Tandem paragliding is one of the best way to discover the world of paragliding. 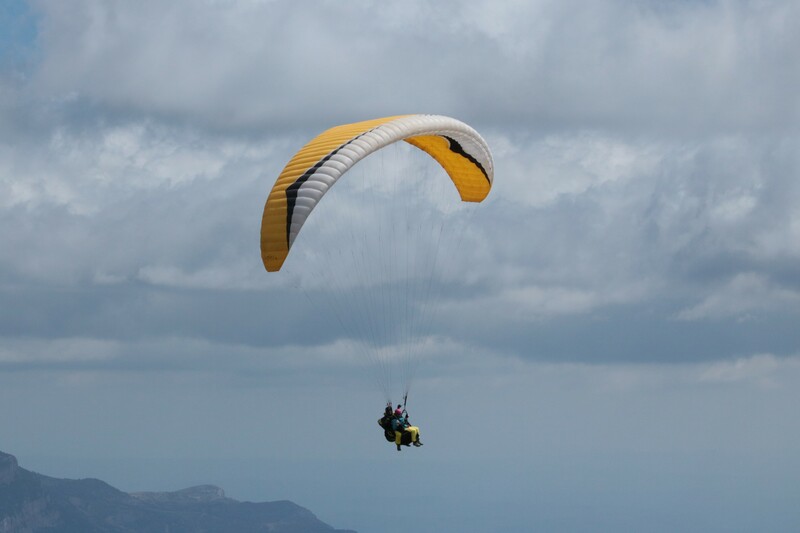 Paragliding is designed to glide: there is therefore no fall effect as in skydiving. A few dynamic steps are sufficient to take-off. Sometimes it can even be done without walking if the wind is there. 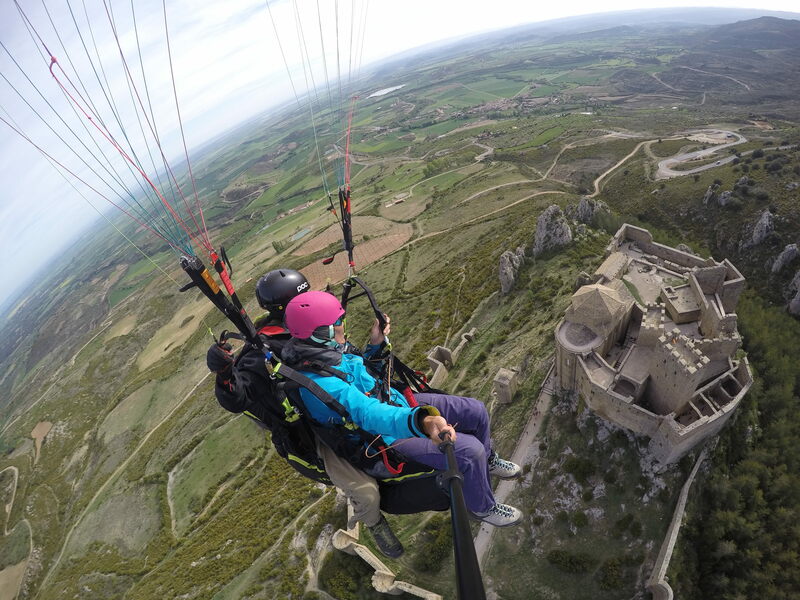 All you have to do is to let the pilot guiding you through the air, comfortably seated in your harness. The landing is similar as the takeoff. Only a few steps are necessary. Here you are back on earth 🙂 with often only one desire… to back up ! 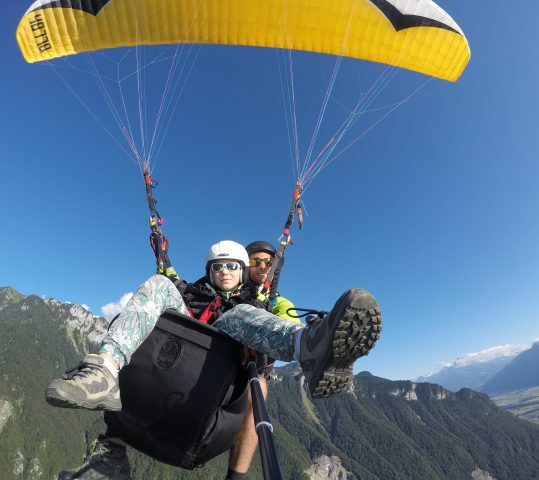 Who can fly tandem ? 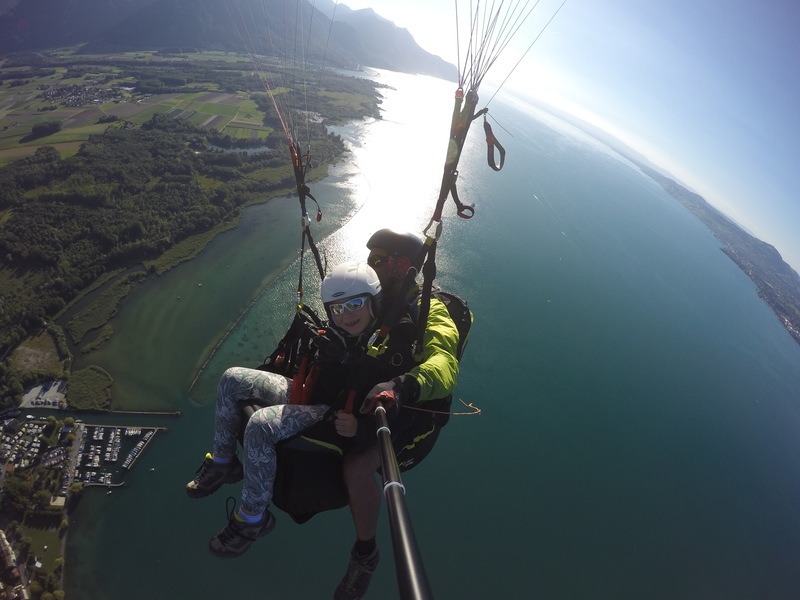 Paragliding is accessible to everyone. No specific physical aptitudes are required. Can children and teenagers also fly ? Of course they can ! 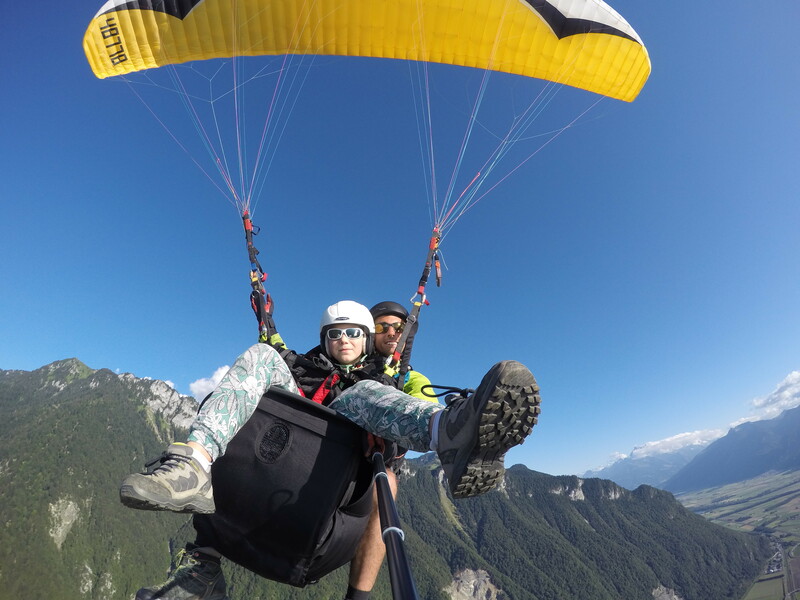 It is important that the choice to fly comes from themselves, but often they are less afraid than their parents 😉 A parental permission is required for those under 14.
Who's a tandem pilot ? 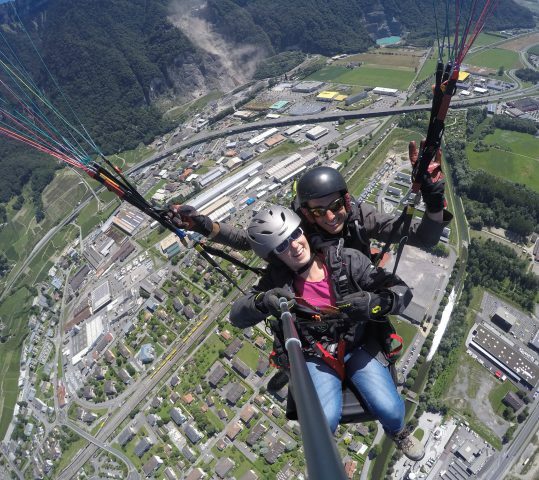 In Switzerland, the tandem pilots must pass a professional licence to fly with passengers. 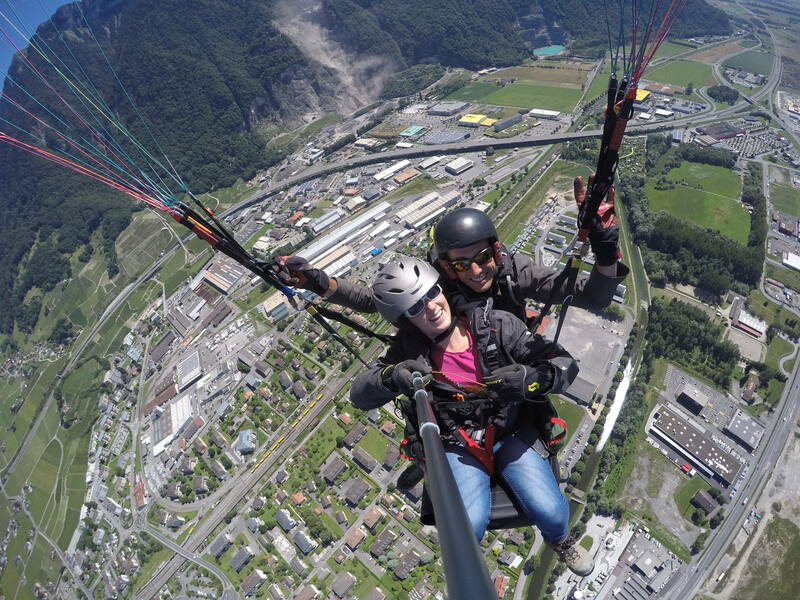 This licence is provided by the FSVL (Swiss Federation of Free Flight). It includes several theoretical and practical exams which are validated by the FOCA (Federal Office of Civil Aviation). This education ensures a high level of competence, and guarantees to the passenger safety and comfort during his flight. 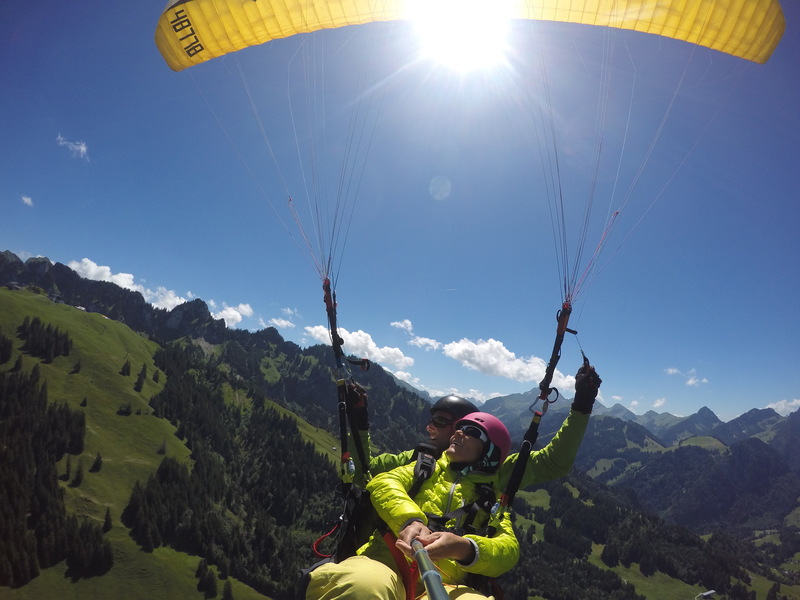 All the tandem pilots who fly for Parapentiste.ch do have the professional tandem pilot licence. Some of them are also paragliding instructors. 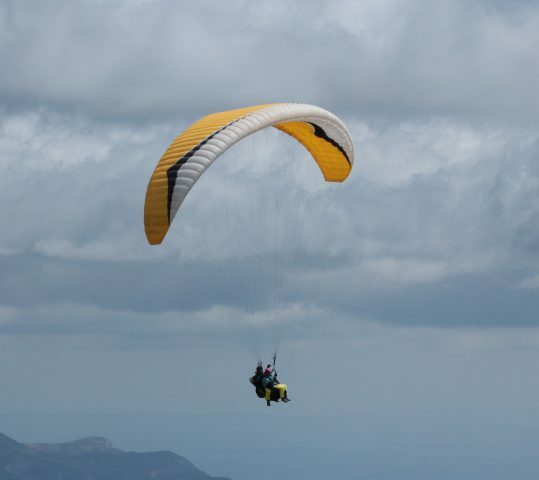 Is it possible to try to pilot the paraglide ? Of course it’s possible ! 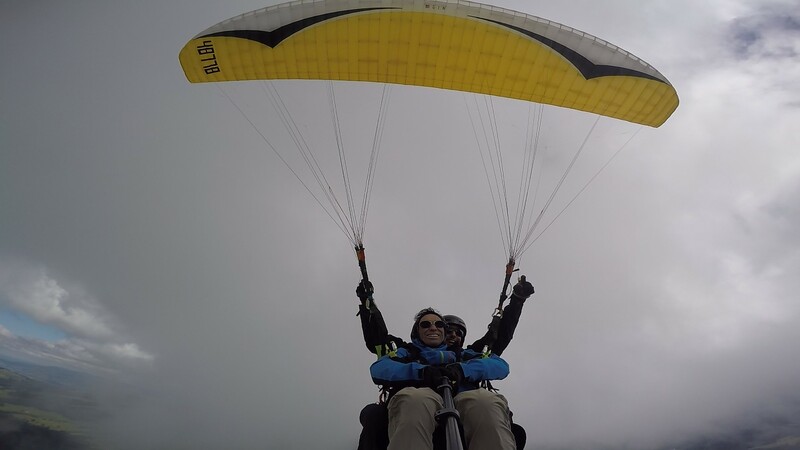 If the flying conditions are calm and allow it : take the controls, follow the pilot’s instructions and… become a paraglider pilot for a moment ! I'm prone to vertigo, can I still fly ? Of course you can ! In the air, the fact of not having a direct link with the ground cuts the vertigo effect. 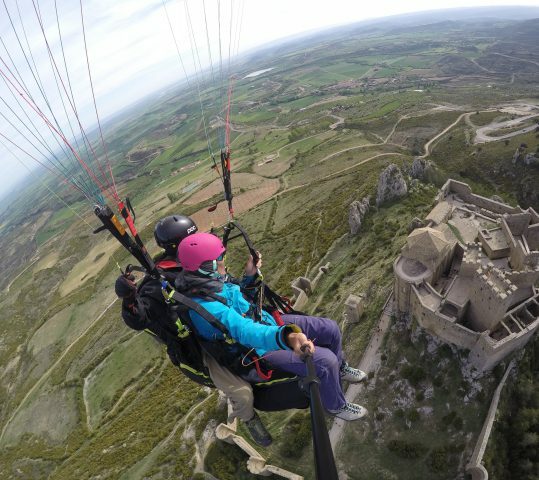 People prone to vertigo are often surprised not to feel it while flying. Is there a weight limit to fly ? The tandem equipment is built for two people. It can carry passengers up to 120 kg. It is also possible to optimise the flying conditions by adapting the take-off time. 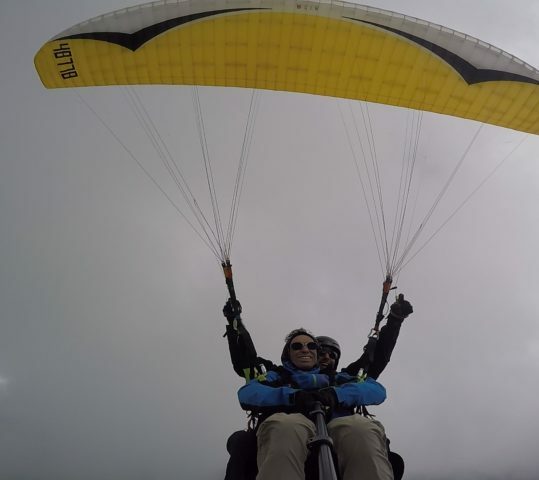 No, paragliding is not a dangerous sport. 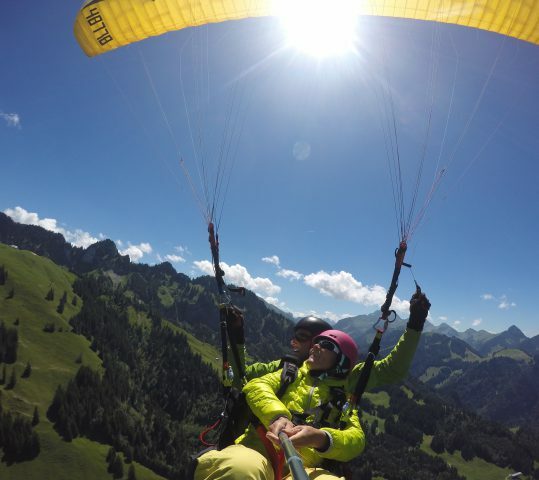 During beautiful sunny days, thousands of flights are made every day in Switzerland. It is a sport in full expansion which tends to become popular. 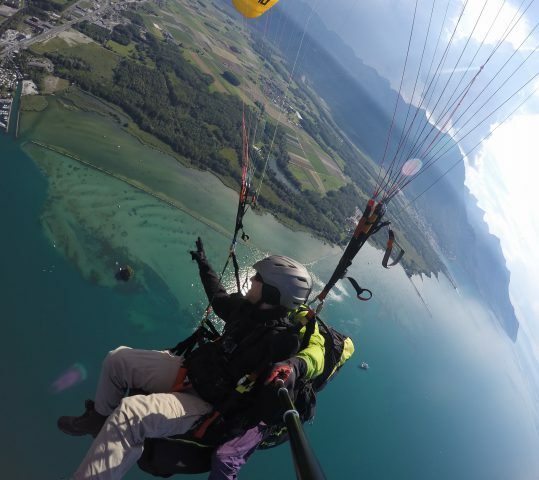 Even the Swiss Confederation honoured him by including a paraglider on the new 50 swiss franc note 😉 Like hiking or climbing, paragliding is not considered as a risk sport by the SUVA. 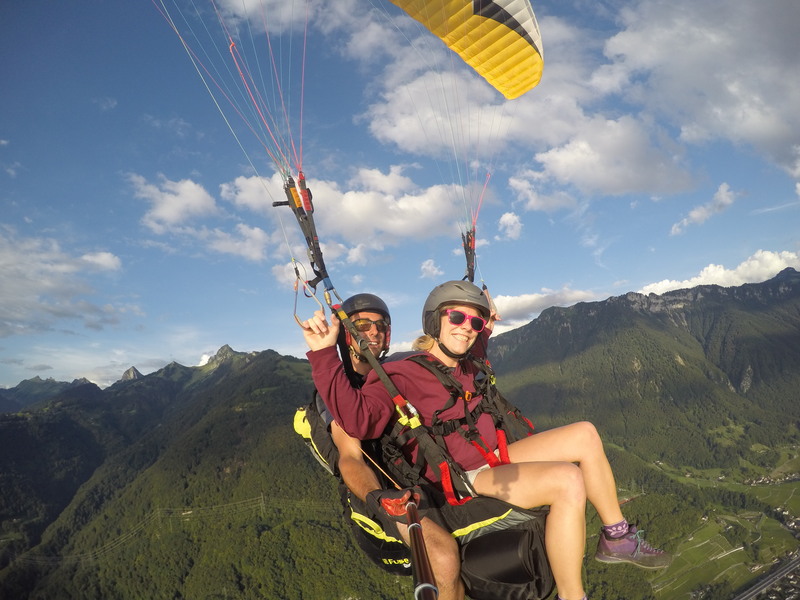 Do I need a special insurance to fly tandem ? Usually not. 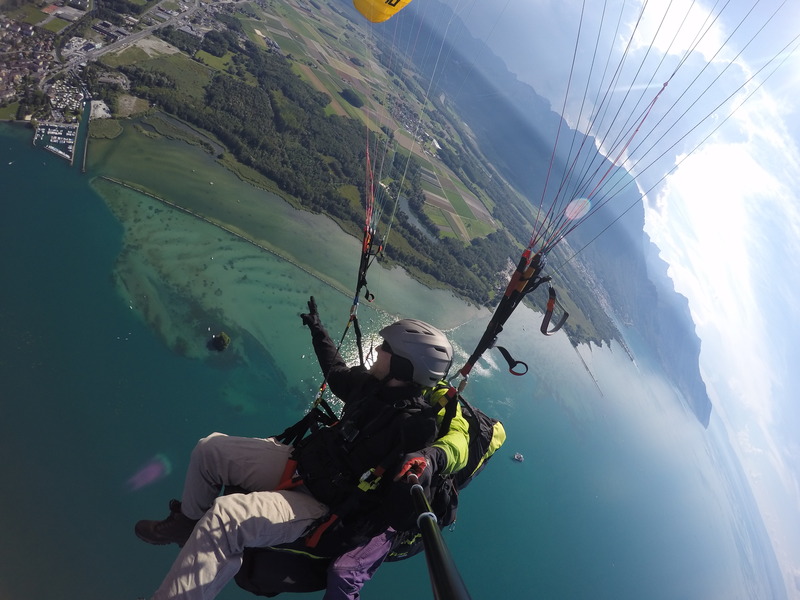 As the SUVA do not consider paragliding as a risk sport, most of the Swiss insurances include paragliding in their conditions. The pilots have an liability insurance but you have to be covered by an accident insurance. Is it possible to take pictures during the flight ? 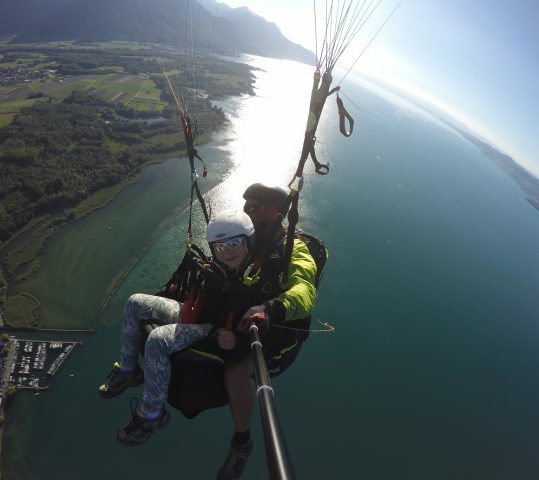 Yes, it is possible to take pictures in flight, so make sure you can attach your camera with a leash. If necessary, the pilots are equipped with Gopro mounted on a pole. These allow us to take pictures, movies and selfies in high definition. What do I need to bring to fly ? Go for it ! And take off with a professional tandem pilot.